Blooming habit. In the Serranía de Hornocal, a range of mountains located 25 kilometers from the city of Humahuaca in the Argentine province of Jujuy. 4722 metres above sea level. 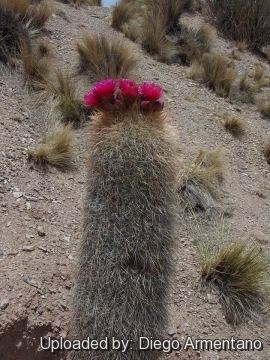 Origin and Habitat: Echinopsis tarijensis is reported in Argentina (Jujuy) and Bolivia (Chuquisaca, Cochabamba, La Paz, Oruro, Potosí and Tarija). Altitude range: 3,200 to 4,200 metres above sea level. Habitat and Ecology: This species grows in high-altitude grasslands with rocky soils together with cacti and bromeliad cushions. The typical cacti are the pasacana (Echinopsis atacarnensis), the poco (Echinopsis tarijensis), and the ayrampo (Opuntia sulphurea). The smallest known cactus species, the Blossfeldia liliputana, is native to this phytogeographic province. Amaras (Deuterocohnia brevifolia and Deuterocohnia lorentziana) and taracas (Puya dyckioides and Puya fiebrigii) grow on the steep slopes and rocky mountainsides. The climate is dry. Frosts and freezing temperatures are common there, but snow and clouds that might keep winter daytime temperatures below freezing are almost unknown (rainfall occurs almost exclusively in summer). Thus, every winter's day brings reliable sunshine, above-freezing temperatures, and the melting of any frost that may have accumulated overnight and potentially caused damage to the plant. Echinopsis tarijensis is common and here are no known threats. 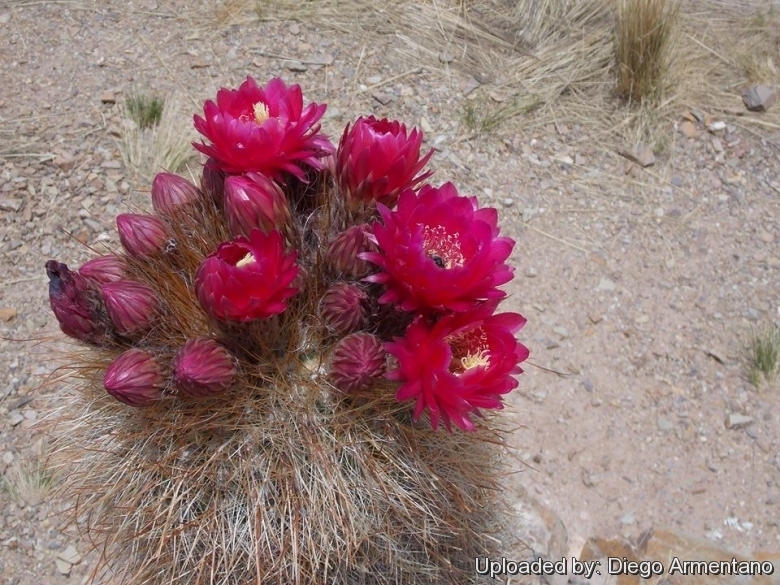 Hybrids from Echinopsis tarijensis and Oreocereus celsianus, (nothogenus Oreonopsis Rowley) have been reported from Bolivia. 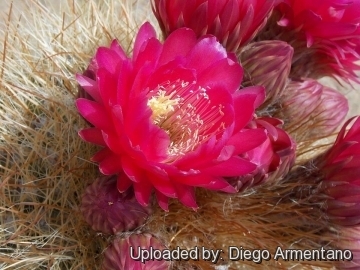 Description: Echinopsis tarijensis (Trichocereus tarijensis) is a tall columnar cactus, solitary at first, later branching from the sides, to 5 metres high. The spines in young stems are long, uneven and robust, while the old stems are unarmed. The flowers borne near the stem tips are funnelform, light or dark red, pink or (rarely) creamy white, to 12 cm long. Two subspecies are recognized by Hunt et al. (2006), the nominate form, subsp. bertramiana (Backeb.) M.Lowry. A third subpecies is recognized by some authors, namely subsp. herzogiana (Cárdenas) G.Navarro. Derivation of specific name: 'tarijensis' For the occurrence near the city of Tarija, Prov. Cercado, Dept. Tarija, Bolivia. Stems: Columnar, stout, dark green, 1.5-5 m tall and 25-35(-40) cm in diameter, simple or sometimes branched. Areoles: Large, prominent, broadly elliptic to oval, close-set, densely grey felted. Spines: 50 or more (missing in older stems), 1-8 cm long, rigid, pungent, swollen basally, unequal, slightly curving, pale brown to whitish. Radial spines: 10 to 50 or more. Flowers: The flowers arise near the stem apex on the plant north sides only, ensuring that the reproductive structures and growing tip will always receive warming sunlight. The flowers are funnel-shaped, red to pink to creamy white, up to 12 cm long, and 9 cm in diameter. Pericarpel and tube c. 8 cm, with acute scales about 1 cm long, with dense white or brown axillary hairs. Outer perianth-segments lanceolate, brownish green, inner spatulate, usually red, sometimes pink or creamy white. Fruit: Ovoid, 3.5-5 long, 2-3 cm in diameter, green. covered with scales and hairs; pulp white. Seeds: Almost kidney-shaped, 1.3-1.5 mm, black. Echinopsis tarijensis (Vaupel) H.Friedrich & G.D.Rowley: (subsp. tarijensis) has about 15 ribs and 3-4 central spines. Distribution: Bolivia and Argentina. Echinopsis tarijensis subs. herzogianus (Cárdenas) G.Navarro: has about 21 acute ribs and a single central spine. Distribution: La Paz and adjacent areas, Bolivia. Echinopsis tarijensis subs. totorensis (Cárdenas) G.Navarro: has about 21 ribs but 3-4 central spines. Distribution: Road to Totora, Bolivia. 7) Lowry, M. 2013. Echinopsis tarijensis. The IUCN Red List of Threatened Species 2013: e.T152131A600687. . Downloaded on 28 February 2016. Cultivation and Propagation: It grow slowly and are cold hardy, but make sure that they are not exposed to severe freezing temperatures, or they may die. They need a well drained soil mix. Water regularly in summer but allow to dry fully before watering again. During the winter months they should be rather kept dry. Since they are big-sized plants, they need plenty of space for their roots. Repotting should be done every other year, or when the plant has outgrown its pot. Propagation: From stem cuttings (if available) in spring (let them dry till the ends callous well. Then replant them in fresh cactus soil that is ever so slightly moist, and keep it that way till they root) or preferably by seeds. Seeds should be sown in a well-drained soil mix. Surface sowing is the best; seeds germinate in 14-28 days at 20° C.